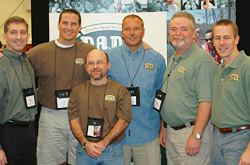 Dads Appreciating Down Syndrome, or D.A.D.S., is a committee or community group (within a local Down syndrome support organization) of fathers of children who happen to have Down syndrome. We hesitate to call our self a "support group", even though we do, in many ways, support each other. The 3 foundational pillars of D.A.D.S. are Support, Action and Fellowship. You won't find us in a church basement drinking warm coffee and whining about having children with Down syndrome. Instead, you'll find us out in the community coaching our kids' sports teams, participating in our children's IEPs, volunteering at local Down syndrome fund-raising events, and even sponsoring fund-raising events of our own. We invite expert speakers to discuss medical, educational, financial, social, and any other issues that affect our children's lives. And of course, we share stories and experiences that are unique to fathers of children with Down syndrome. Your colleagues at the office may not understand your excitement when your 5 yr old makes "poopie" on the toilet for the first time, but other D.A.D.S. will, because we've all been there.